The professionals who restore normalcy to their clients’ homes and businesses after a fire or flood have to know the best way to respond in each situation. One person may have had an electrical fire sweep through the attic while another may have a flood gurgling up from their dirt- or cement-floor basement. Attics and crawl spaces are commonly affected by water and fire damage and often require special remediation techniques and considerations due to materials, access restrictions, size limitations and other factors. Substances such as smoke, soot, gas, pollen, mold and particulate matter enter the air. Ventilation must be maintained for the health and safety of workers. Odd angles and corners characterize nearly every basement and attic. All these factors create restoration challenges. After a fire or flood, you typically encounter mud, sludge, fire-extinguishing chemicals and others substances already mentioned. Depending on the situation, a business might need dehumidifiers to extract water and air movers to dry the area and keep air circulating. There may be limitations based on the dimensions of the work area, especially regarding height. Most situations call for maximum strength, but often that power must come in a small package to accommodate attic or crawl space work. A restoration business must also dry or replace insulation, dirt floors, wood, cement and other materials, and finding and erasing the damage typically involves awkward positions. Smoke and soot infiltrate everything, and contractors have to be ready to handle the damage. The Occupational Safety and Health Administration introduced new rules in 2015 regarding confined spaces without proper clearance, such as crawl spaces. OSHA’s research, which they conducted over nearly 20 years, showed a need for regulation of the tightly configured places where crews work. A job space has limited egress. The work site is big enough for a human to access. The place isn’t designed for occupancy. Contractors now need a permit to enter most kinds of confined spaces and have a general confined-spaces permit. They have to conform to safety rules and train workers in OSHA safety practices. Some wonder why all the regulations have to be included. Worker fatalities motivated OSHA, the EPA and constituents of the relevant industries to decide the rules are necessary and implement them. Among the early signs was the death of a worker in 2004 who was found in a confined space at the bottom of a utility hole where a new sewer system was under construction. The medical examiner determined oxygen had been low and carbon monoxide had been high. An investigation into the man’s death found that his employer had no confined-entry plan or precautions in place. Another case involved two worker deaths resulting from working in a crawlspace using an incandescent lamp. The light ignited vapors from the primer they were applying. A flash fire caused by poor ventilation in an enclosed area killed another worker who was spraying insulation in an attic. Inadequate air circulation creates dangerous environments, so it’s crucial to be aware of the risks and take steps to prevent the safety incidents they cause. Leaky roofs, weather events and other incidents cause attic water damage and flooding. It’s essential that you accurately assess the space, assign the right resources for the job and make safety a priority in these scenarios. 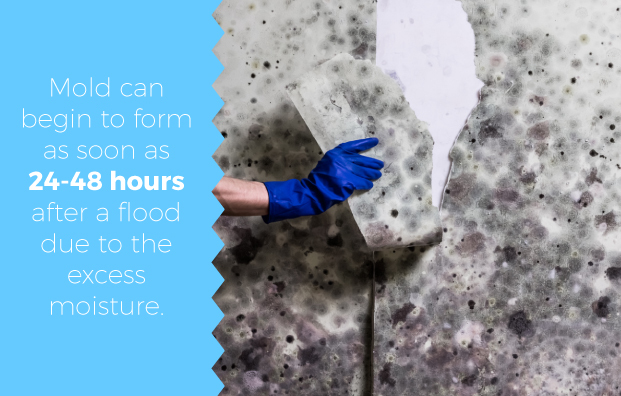 Mold can begin to form as soon as 24 to 48 hours after a flood. Once it starts growing, it releases spores, which are like tiny seeds that spread the mold and pose respiratory and other kinds of health hazards to building occupants and workers. The Federal Emergency Management Agency (FEMA) recommends that anyone with more than 25 square feet affected by flooding should contact a remediation professional. This means that if it’s more than a few drops from a leaky roof, it’s a job for professionals. If there is electricity to the work area, turn that breaker off and have an electrician check the structure before plugging in elsewhere. Pump out or otherwise remove standing water. Remove the source of moisture and all wet materials, including insulation, flooring and drywall. In low-clearance situations, consider the use of a compact dehumidifier and smaller air mover models. Assess the area and the broader structure to see if mold has formed and if so, how far it has spread and how much it has grown. Measure the area of the project, because physical dimensions are an essential factor in determining necessary equipment and other resources. The surface-area measurement of a damaged space, rather than linear feet of the room, is the most important to know. Based on your assessment of the damage and the limitations of the space, choose your equipment. More information on optimal equipment placement can be found here. Remove any mold and use a peroxide-based cleaner on all structural surfaces. Monitor the air in the project area with a meter daily. Apply a disinfectant spray to all structural surfaces. Dry the area again if needed. Apply a layer of mold preventative to all structural surfaces and install a vapor barrier if moisture and mold are an ongoing concern. Establish a dehumidifier if necessary for long-term moisture control. Electrical mishaps cause 43 percent of attic fires. 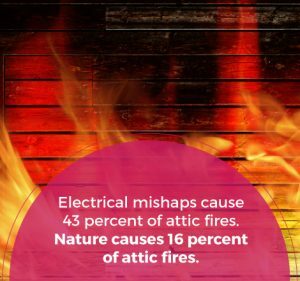 Nature causes 16 percent of attic fires. Attic fires number about 10,000 annually in the United States. People die from attic fires at the approximate rate of 30 per year (based on data from 2011). Attic fires injure about 125 people per year. About 90 percent of residential attic fires occur in one- or two-bedroom homes. One-third of residential attic fires spread to other parts of the structure. FEMA’s statistics regarding recent wildfires are likely to be astounding. As contractors deal with the real-time effects of these statistics in fire damage restoration, they first determine if the blaze was a low-pressure fire or a high-pressure fire. A low-pressure fire typically has plenty of oxygen and blows debris into the air, resulting in it landing on materials and forming a surface layer. A high-pressure fire usually has low oxygen and is under pressure, so it permeates materials such as insulation and structural elements. The kind of fire that happened impacts how you decide to clean up after it. The first step of cleanup is the same for both types of fire — remove all contents and materials from the space. The restoration steps differ from there. Common to both types of fires and the related restoration process is the need for ventilation and air circulation in the area. The same basic steps would apply in the case of smoke damage in a crawl space. Employ a pump or pressure sprayer to apply a de-smoking solution to all structural materials and surfaces that are oriented horizontally. Clean all affected surfaces with a degreaser. For places with heavy damage or charring, try sandpaper and other abrasives and work from bottom to top. Mix a solution of encapsulant and/or odor counteractant and apply it with a fogger or paint sprayer to any salvageable insulation. You can also use an additional round if necessary. Thermal fog the entire affected area with an odor counteractant. If needed, you can apply smoke sealer, but only do so after you have completely cleaned the surfaces and removed any unsalvageable debris. Replace any unsalvageable insulation and add a layer, both to increase R-value and to cover any discoloration on the salvaged insulation. Remove all insulation and bag it for disposal. Use an odor counteractant designed to handle smoke odors to treat the area. Use dry-cleaning sponges to clean away heavy soot. Be sure not to apply too much pressure and push the soot into the porous surfaces of walls. You can manage surfaces and objects that sustain severe smoke damage or charring in two ways. Most contractors will use sandpaper or another abrasive to clean away the soot and charring, or if the damage is severe, the material should be completely replaced. Apply a degreaser to all the structural surfaces. If the smoke odor is very strong, you can mix a smoke odor counteractant in with the degreaser. Thermal fog the entire affected space with an odor counteractant. Seal all the affected surface area not being replaced with an appropriate sealer. One of the most common chemical compounds used to clean soot and ash is trisodium phosphate, but there are many options, and it’s up to the restoration professional to decide which is best to use for any given situation. Fire and smoke damage in a crawl space or attic should always be handled by a professional. The mix of removal and treatment chemicals is another good reason to hire a professional and let them apply a solution that’s neither too strong nor too weak. An experienced remediation person will also be familiar with the exact amount of pressure to use for soot removal, so as not to make the damage worse. Fire and water damage restoration of attics and crawl spaces will require some of the same equipment, however, there are several chemicals and pieces of equipment that are unique to each. The exact tools, materials and equipment needed will depend on the source of the water damage, the extent and the affected space. Appropriate PPE (personal protective equipment): This will likely include protective eyewear, gloves and respiratory protection as well as protective clothing. Be sure that everyone who enters the damaged environment has the proper PPE and training to be there. Water extractor: You will want to remove any standing water before starting your restoration work. Air mover fans: These will help to circulate air and dry the affected area when combined with the use of dehumidifiers. HEPA air scrubbers: If there is the potential for mold growth, or the source of water damage is cause for health concerns, air scrubbers can help to remove the harmful spores and particles from the air. Microbial disinfectants and peroxide cleaners: These will help to clean and prevent the growth of mold on affected surfaces. Moisture meters: These will allow you to measure the progress of drying the attic or crawl space. Appropriate PPE (personal protective equipment): This will often include respiratory protection, protective eyewear and protective clothing among other PPE essentials. Air mover fans: These help to provide air circulation and ventilation in the affected area. Depending on the space, you may also need to use ducting. HEPA air scrubbers: These help to remove airborne contaminants like soot from the environment. Portable restoration equipment is essential in these types of spaces and a smaller compact HEPA air scrubber is ideal here. Dry cleaning sponges: These will help to remove soot from affected surfaces. Sandpaper: This may be needed in addition to the dry sponges to sand away badly charred or otherwise damage surfaces. Cleaning and odor-removing chemicals: Depending on the type and extent of fire and smoke damage, you will need some combination of odor counteractants, encapsulants, degreasers and sealers. Pump sprayer: A sprayer that is meant for use with chemicals will be needed for the application of odor counteractants onto affected surfaces. Thermal fogger: This is used to treat the affected area with smoke deodorizers and disinfectants. In addition to these items and pieces of equipment, you will also need any materials to replace those that were too damaged to restore and were thrown away. You may also find for either fire or water restoration in these types of spaces that you need materials for creating a barrier to contain the odor, potential mold growth, etc. Air movers, dehumidifiers and air scrubbers are some of the most common pieces of equipment that you will find yourself needing on restoration jobs and having easily portable restoration equipment is especially important for working in compact and hard to reach spaces like attics or crawl spaces. 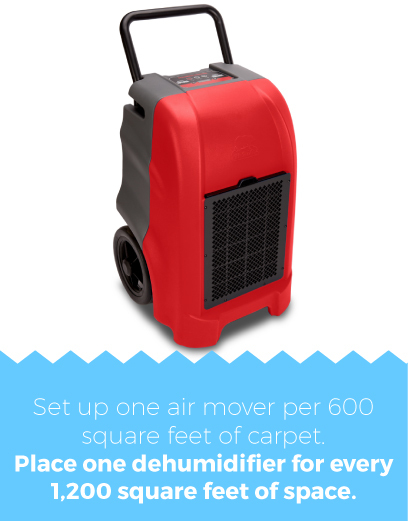 Dehumidifiers should do exactly as their name implies and remove moisture from the air. B-Air® offers conventional dehumidifiers and LGR types. Most professionals choose a commercial dehumidifier based on how much water it can remove. Water removal is measured in pints per day (PPD). There are two kinds of standard measuring units for it: Saturation and that of the American Home Appliance Manufacturers (AHAM). The basic difference in the standards is the conditions in which dehumidifiers undergo testing. 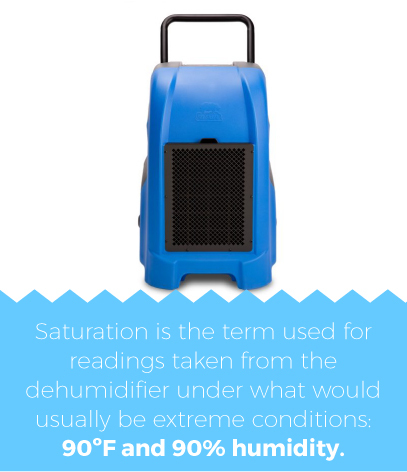 Saturation is the term used for readings taken from the dehumidifier under what would usually be extreme conditions: 90 degrees Fahrenheit and 90 percent humidity. AHAM tests the same way but in conditions of 80 degrees and 60 percent humidity. For example, our B-Air® Vantage VG-1500 commercial dehumidifier removed 150 pints under saturation testing and about half that under AHAM testing conditions. Air movers come in two basic types: centrifugal and axial. Centrifugal models are also known as “snail fans”, and axial varieties look more like the type of fan that people are used to seeing. A centrifugal air mover delivers faster-moving, higher-pressure air that it can force through ducts and tubes if needed. An axial mover has blades that rotate around an axis and provides a higher volume of air than a blower but at a lower pressure. An axial air mover provides excellent air circulation and may be a good option if a concentrated, high pressure airflow are not needed. The low-profile B-Air® Ventlo-25 air mover packs one-quarter horsepower into a small package, with rounded dimensions of 11x19x23 inches. It’s ideal for tight, low-clearance spaces and can be daisy-chained together. For added utility, this model is stackable for easy storage, and each has a kickstand to give the front end several inches of adjustable lift. The B-Air® Grizzly GP-1 air mover measures 20x18x25 inches and outputs a strong airflow from a 1 horsepower motor. It has three speeds, four angle positions, a kickstand and the ability to run all night or day. Axial air movers also range from about one-quarter to one horsepower with varied sizes of blades, speeds, air volume. They also come in various colors so that businesses can match their equipment to their brand colors and increase brand recognition. The best-practice technique when using air movers is to position a number of them within the project space opposite each other but in a staggered way so that no two air movers or blowers are focused on the same area. Air scrubbers come into play mostly when there has been heavy fire damage or smoke permeation, as well as during the mold removal process. HEPA filters remove dangerous particulates such as soot and charred materials from the air. The B-Air® Raptor RA-650 has up to three stages of filtration. It cleans filters particles such as soot particles, mold spores and pet dander from the environment. The RA-650 has a variable-speed switch for versatility, can be daisy-chained together if desired, has a one-third horsepower motor and meets or exceeds rigorous industry safety standards. Another model we offer is the B-Air® Raptor 650 HEPA, which includes superior quality in the two most essential elements of a filtration system, the HEPA filter and the rate of air flow. The standard of removal in most average air movers with a HEPA filter is as small as .3 microns. B-Air® can cater to all your equipment needs for restoration of attics and crawl spaces after a fire or flood, as well as other jobs that require air movers, dehumidifiers, scrubbers, blowers and related accessories. With a number of convenient options for purchasing equipment, including through Home Depot or distribution partners like Aer Industries, it’s easy to get the quality professional equipment that you need. The contractors who depend on us get equipment that meets or exceeds their expectations for quality, durability and affordability. Along with the excellence of B-Air® equipment comes knowledgeable, courteous, efficient people eager to help. Besides remediation and restoration professionals, we also serve many janitorial, sanitation and pet-grooming businesses that find themselves in need of quality equipment. B-Air® has been manufacturing restoration equipment for nearly 20 years, so we understand the needs and demands of the restoration industry. Our equipment designs and engineering have grown and evolved in response to our customers’ needs, so there are many options available for your operation. Shop online or contact us today with any questions!